If the Baltics had not joined NATO, who can doubt that Putin would view them the way he did Crimea – a geographically important piece of real estate that should be under his thumb. Estonia and Latvia have large Russian populations, which would have provided a convenient excuse for Russian aggression. Putin finds the Baltics particularly irksome because their visible success is testimony to the advantages of democratic capitalism relative to his governing philosophy, which is best described as authoritarian kleptocracy. When Putin decried the break-up of the Soviet Union as the worst tragedy of the 20th century, he signaled his geopolitical strategy. He is determined to reconstitute Greater Russia, and one reason that his first adventure was in Crimea and not the Baltics is because NATO pushed him further east. We must not accommodate his geopolitical goals and should ensure that the response to the recent aggression in Ukraine takes place within the larger context of our commitment to support the democratic aspirations of all of Russia's neighbors. Russia under Putin does not put much of a premium on a respectful relationship with Europe or the United States. The Russian exercise of power derives primarily from its nuclear arsenal, its permanent seat on the U.N. Security Council and its large reserves of natural gas and oil. All three of those levers become less powerful to the extent that Russian foreign policy has to accommodate the institutional structures and norms that characterize Western democracies. We can hope that over time Russia will change its behavior and embrace the notion that a constructive relationship with its neighbors and the broader European community is a valuable goal. But that is a hope and, for now, not a particularly realistic one. For the United States, we need to accept the reality that while we may still find narrow avenues of cooperation with Russia, it is untenable to condition any of our foreign policy initiatives upon an assumption of long term cooperation with the Russians. Foreign policy may begin at home, but it does not end there: now is not the time to think that the world will stop while we repair our bridges, roads and address our social programs. Those demands won’t go away, and neither will the demands for a robust U.S. presence on the world stage. There is no practical military response to Russia's actions, which is the exact reason that we need a comprehensive diplomatic strategy which, more than anything else, makes a long term commitment to counter Putin's territorial and political ambitions. While it will be convenient to condition our policies on cooperation from other European allies, primarily Germany, we must not predicate our obligation to lead on their willingness to follow. First, we need to communicate that our position on Ukraine is completely consistent and derivative of our long term interest in promoting freedom and democracy around the world. Our policy is not to oppose Russia but to support freedom. Second, our rhetoric should match the reality of our actions. Strong condemnations of Putin's actions followed by limited sanctions of limited scope is of limited value. If anything, our actions should be at least as powerful as rhetoric. Third, we need presidential leadership. If we want to promote democracy in Eastern Europe as an enduring component of our foreign policy, then we need President Obama to use his office to educate the American people and Congress on why Russia's actions have been dangerous and must be countered. In many ways, we are experiencing the foreign policy equivalent of Ground Hog Day. We need to set our clocks back to 1989 and take a page out of American diplomatic history. During the 15 year period beginning in 1989 and spanning both Bush Presidencies and the Clinton Presidency, the United States led a comprehensive effort that redrew the European landscape, restoring freedom and democracy to a countries that had spent the entire post-World War II period under the repressive yoke of the Soviet Union. Democracy either spreads or recedes. Now is the time to recommit ourselves to the simple ambition of celebrating the end of the Cold War as the moment when the world saw a permanent increase in the number of democratic countries and not simply an interlude between periods of authoritarian repression. « Previous entryWhat I'm reading: End of right vs left in Europe? Putin has turned Russia into a true rogue state. It should be treated as such. The illegal annexation of Crimea should never be recognized, of course. The U.S. and U.K. should now honor their obligations under the Budapest agreement to protect Ukraine's sovereignty. They pathetic sanctions against a few individuals are too little, too late, a joke. Make real moves to show Putin the only language he understands, force. Google grief, what a dumb statement this is, Sash. For your information, the people of Crimea have already spoken through a plebiscite or do you oppose academic freedom? Anytime the right-wing thugs in Washington can't manipulate an election, they call it a "sham"! And every time you don't agree with someone you cry "Google grief, what a dumb statement this is, Sash." Perhaps you should "Good" why, in a debate, that's cowardly. You're right banish, I meant to say "Good", not" Google". A well written argument Kim. Please note that we are speaking of Putin and not the Russian people as they are held hostage in Stockholm’s syndrome. Yes, NATO has kept others from this demise and is a remedy. Yes, sanctions seem weak compared to what happened with South Africa and Nelson Mandela even. Beyond that isn’t it time we moved into alternative energy sources anyway? It is all so logical, but painful and requires effort, adaptation and change. Growing Pains. I have faith. I have faith in the enduring spirit of a brotherhood that looks to give what it has been given. How else can we really enjoy the gifts of freedom if we are the only ones to have it, you can’t. You only have it when you give it away and in that we need to be there and do all we can or quite frankly I think in the end we may endanger our own freedoms. "Democracy either spreads or recedes"
Complete nonsense. Countries need to grow towards democracy and that takes time. In the case of Ukraine the country has twice been set back towards oligarch rule by US sponsored "revolutions". I agree, Russia's actions must be countered. I would take it a step further. We should have two aircraft carriers and 20,000 troops in their doorstep now. Today! 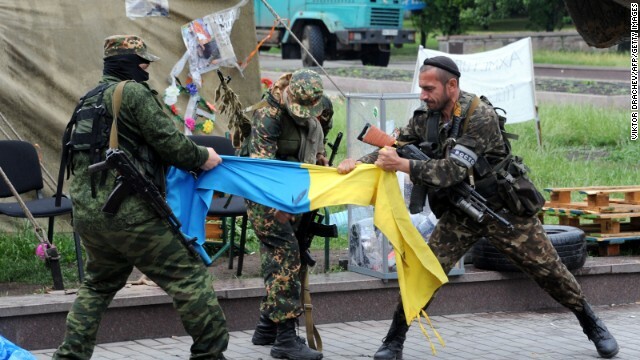 See those three thugs defacing the Ukrainian flag? Those cronies need to be skinned, alive and fed to the sea gulls. George, you are so right. And yes, we need to expand the EU with the United States by her side. This will teach these Russian Putin comies that we mean business. Enough of the attacks on Ukraine by Russia. We stand by our allies. Obama has shown credibility, yet restraint. He is a great president. I love this Harvard man. And remember, American ends with "ican"
We as a nation have spread and protected democracy all over the world for over 200 years. We must continue this journey. Let us not forget our history. Let us not forget what the Germans tried to do in two major wars. Let us not forget The Alamo. Thank you Patrick. You said it all. Don't feel bad Tom. This clown does this to me all the time. I call him Phunnie boy.